Successfully Added USB Optical Mouse with 4D Trackball to your Shopping Cart. USB Optical Mouse with 4D Trackball - An intelligent, next-generation, mouse that comes in an ergonomic design to provide maximum comfort and functionality. This new computer accessory is also plug-and-play and sure to be a hit. This plug-and-play USB Optical Mouse comes ready to go and will start working right out of the box. There's no need for batteries, additional software, or any kind of setup, just plug in the USB cable for instant access to fast-tracking, high-resolution, and smooth optical trackball technology, which provides maximum comfort to users and introduces a new and much more accurate way for navigating your laptop, netbook, or computer. 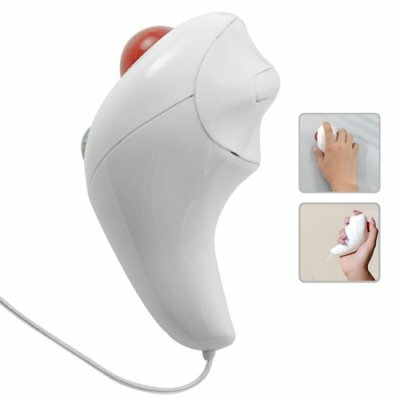 Featuring a unique 4D trackball, this USB Optical Mouse can be used to navigate your laptop/netbook while in the car, standing up, or even lying on your bed. The off-table usage is both comfortable and convenient and allows users to avoid eye fatigue and radiation harm by being able to sit further away from the monitor. The mouse also fits and works perfectly in both your left and right hand, making it even easier to use for everyone! More importantly, studies have shown that two thirds of office staff suffer from repetitive strain injury (RSI), which costs hundreds of millions of dollars in lost working hours, while further studies have shown that relief may be found by simply switching to a more ergonomic mouse. With this USB Optical Mouse, you can finally use your computer in whatever position you want to avoid harming your wrist, palm joints, and muscles. This unique USB Optical Mouse with 4D Trackball combines fashion with comfort and functionality to make it the ideal computer accessory. Available in our warehouse now, order today and we'll express ship it tomorrow. Brought to you by Chinavasion, the leader in wholesale electronics and tech gadgets. Can you use this USB Optical Mouse with both your left and right hand? Normal use is mainly for right-handers. When using the 4D trackball, however, users can comfortably use either hand.